IS shelling yesterday of al-Jorah neighborhood, northern Deir ez-Zor, caused the death of 4 individuals. 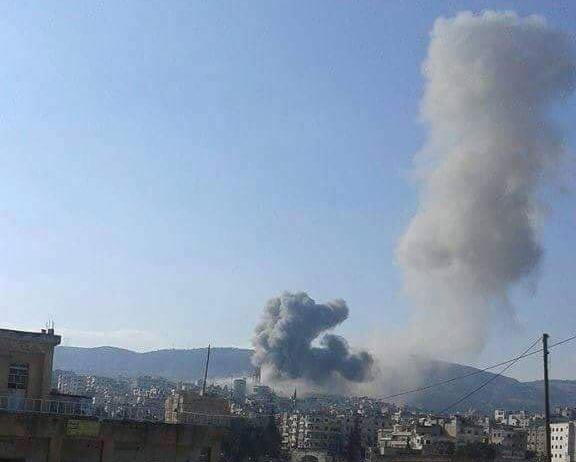 RuAF airstrikes on Jisr ash-Shugur. Image courtesy of @sayed_ridha. RuAF airstrikes and SAA artillery shelling of Qabtan al-Jabal, a village 18 km west of Aleppo, during the night caused the death of 8 members of the same family. Further SAA and RuAF attacks on Dar Taizzah, 8 km further west, killed 3. Later in the day, 5 RuAF airstrikes on Ma’arat al-Artik, 8 km northwest of Aleppo, caused the death of 3. Opposition forces renew their offensive against the SDF in Ayn Daqnah, northern Aleppo countryside, in an attempt to regain control over the village. SAA and opposition forces clash in al-Mallah Fields, north of Aleppo. Reports of casualties on both sides. Airstrikes on an oil refinery in the outskirts of al-Bukamal, apparently conducted by the RuAF, caused the death of 4 workers in the refinery. Opposition shelling of SAA-controlled al-Jamelaiah neighborhood, central Aleppo, caused the death of 8 individuals. 5 killed by RuAF airstrikes on al-Atarib, a town 29 km west of Aleppo. 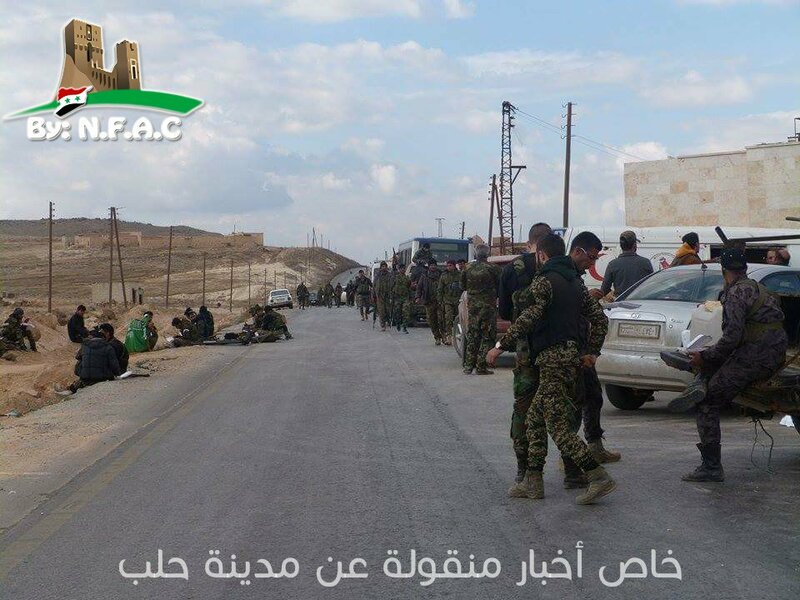 Opposition forces close off the road between A’zaz and Afrin, northern Aleppo Governorate, in response to Kurdish advances in northern Aleppo. Opposition rockets that hit SAA-held civilian locations in al-Zaharaa neighborhood, western Aleppo, caused the death of 5. SDF clash with IS forces in the vicinity of Tishrin Dam once more. Reports of 3 SDF casualties in addition to more casualties reported on both sides. Clashes break out between SAA and opposition forces in Sayf al-Dawla neighborhood, southwestern Aleppo. 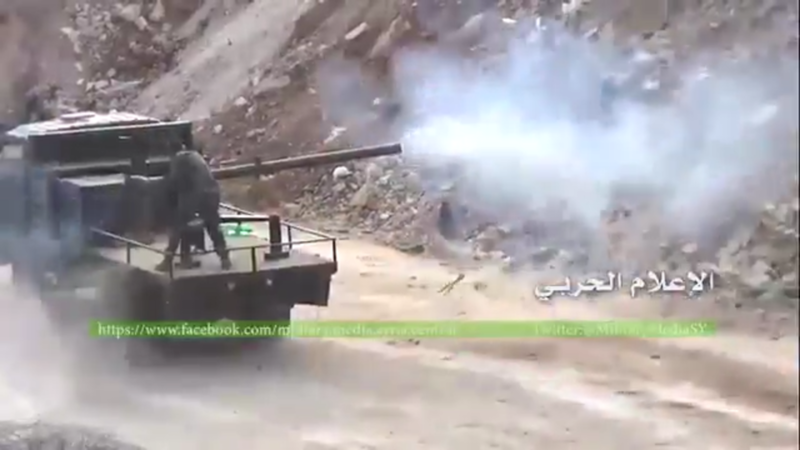 SAA reinforcements in Khanaser battelfield. Image courtesy of N.F.A.C. IS reinforced by some opposition factions including Turkestan Islamic Party forces launched an attack against SAA and al-Quds Brigades on the road between Aleppo and Khanaser. The attack managed to cut off the SAA supply line for most of the day. Other clashes broke out between SAA and IS forces on the road between Khanaser and Ithriyah. Some SAA casualties reported. Later during the day and with heavy RuAF air support, SAA managed to retake all lost ground in the area. Fighting breaks out between IS and SDF fighters in the vicinity of Sarrin, 111 km east of Aleppo. Some IS casualties reported. SAA soldier firing a cannon on opposition locations in western Aleppo. Image courtesy of @MilitaryMediaSy. Opposition shelling of western SAA-controlled neighborhoods in Aleppo caused the death of 10 individuals. 4 killed by RuAF airstrikes on areas in northern Aleppo countryside. Turkish artillery strikes on SDF locations in northern Aleppo Governorate continue as more than 7 hours of continuous shelling was carried out by Turkish artillery on A’zaz, al-Malikia, and other SDF locations in northern Aleppo. SAA, NDF, and al-Quds Brigades vs opposition forces in the vicinity of Family House Amusement Park, western Aleppo. Reports of casualties on both sides.